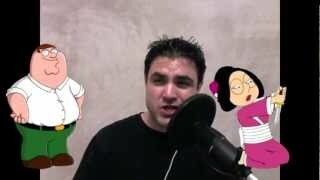 This is me in the video, Paul Vlahos, not Seth Macfarlane!! I am hairier looking. Thanks for watching. Man Rapping To Chris Brown's "Look At Me Now" All In Family Guy Voices! Man Rapping To Chris Brown’s “Look At Me Now” All In Family Guy Voices! (Original) ... Look, Original, Rapping, Voices . Tweet. Share This Post . Man Rapping To Chris Brown's "Look At Me Now" All In Family Guy Voices! ... Man rapping "Look at me now" by Chris Brown ... Rap! Chris Browns 'look At Me Now' Original.